Click links in underneath scheme for race results and stage reports, including overall standings. Click stage 21 for the final GC. The last stage of the Vuelta totals almost 100 kilometres and the race boils down to a bunch sprint with John Degenkolb besting Danny van Poppel. Fabio Aru wins the Vuelta 2015, Purito is second and Majka third. Stage 20 leads in 175.8 kilometres from San Lorenzo de El Escorial and Cercedilla. The race totals four climbs and Plaza soloes to victory over three of them, while Fabio Aru drops leader Tom Dumoulin at the penultimate climb and takes the red jersey. Purito is second in the 2015 Vuelta, Majka third. And Dumoulin? He freefalls to sixth place overall. In 185.5 kilometres stage 19 leads from Medina del Campo to Avila. Alexis Gougeard attacks in the front group at the Puerto de la Paramera and in 30 kilometres he soloes to victory. The GC-contenders are a quarter of an hour down, but once at the cobbled climb leading into Ávila leader Tom Dumoulin leaves his rival Fabio Aru and he powers to a 3 seconds win. Purito and Majka lose even more time. Stage 18 offers a hilly parcours with the 1st category climb Puerto de la Quesera in the finale. It's there Nicolas Roche leaves the break of the day and he is accompanied by Zubeldia. The Irishman outsprints Zubeldia, while Aru attacked Dumoulin at the closing climb, but to no avail. 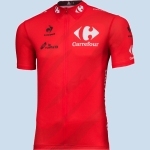 The Dutchman retains the red jersey. The ITT is 38.7 kilometres on a mostly rolling parcours with a 1.5 kilometers climb in the finale. Tom Dumoulin powers to the win and takes the red jersey, with a 3 seconds lead over Fabio Aru.